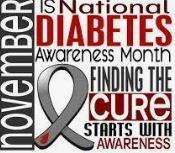 Go "Blue for Diabetes" on Monday, November 26! More than 84 million US adults—over a third—have prediabetes, and 90% of them don’t know they have it. Diabetes is the 7th leading cause of death in the United States (and may be under-reported). Click here for an article about important facts that teachers should know regarding Type 1 Diabetes.